Summary: Learn how to fix mosaic tiles to a wall. Mosaic tiles come in sheet form with the small individual tiles held together by a fabric mesh backing. Mosaic wall tiles are popular because they are easier to work with than normal sized ceramic tiles. Mark out the area you want the tiles cover. To do this use a length of batten and a spirit level, marking the outline of the area with a pencil. Apply the tile adhesive with a notched spreader to the wall creating evenly spread ridges. Put the first sheet of tiles against the wall keeping the edge of the sheet aligned to your guideline. Press the sheet of tiles firmly into place with your hand. Using an off-cut of wood, tamp the tiles level to create an even surface. Pay particular attention to the edges. 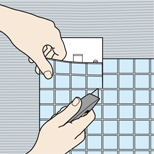 To tile around obstacles such as electric sockets or light switches, cut out the shape from the tile sheet using a craft knife. Do not worry about any narrow gaps between the tiles and the socket, as these can be filled later. Position the sheet against the wall and tamp into place. Continue to lay the sheets until the area is covered. Then you can return to the gaps left around the sockets and other obstacles. 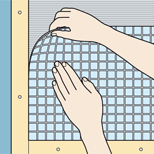 If fixing sheets of mosaic tiles above the first row, spacers should be used to maintain the gap between the top edge of the lower row and the bottom edge of the top row. Cut off a strip of tiles from a sheet. Measure the gaps around the sockets etc and transfer the measurements to the strip of tiles. Score a line at the correct width across all the tiles. To break the tiles along the scored line use tile nibblers or a cutting wheel and snapper. Then fit the tiles into place. Allow the adhesive to dry for 24 hours before grouting, remembering to use waterproof grout in bathrooms and kitchens. Use a rubber edged spreader to spread the grout pushing it into all the gaps. Clean the surplus grout from the tiles as you go. You can also use a piece of dowel or a grout shaper to run along the gaps to produce professional looking grout lines. 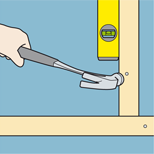 Use lengths of batten and a spirit level to mark the outline of the area you wish to cover. Put the first sheet of tiles against the wall aligned to your guideline and press it firmly into place. For obstacles, cut out the shape from the tile sheet using a craft knife. 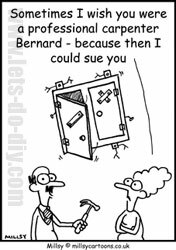 Join an existing conversation or create a new thread related to Kitchens and bathrooms in our DIY forum.